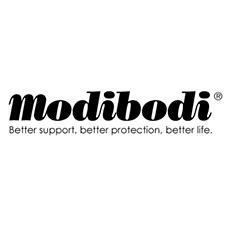 Modibodi is an Australian company making beautiful, comfortable, scientifically supported underwear to protect women against sweat, light bladder leaks, period overflow and spotting. Modibodi's technology uses a high quality, fibre blend including Bamboo and Merino Wool to produce their light leakage and period underwear. This unique design is called Modifier Technology™ which provides a slim, breathable, absorbent, antimicrobial fabric that is stain resistant and leak proof, making regular, wasteful disposable liners a thing of the past! Modibodi incontinence and menstrual underwear are designed to look and feel just like regular underwear, giving you the ultimate comfort while also protecting against leaks. You'll never know the difference between ModiBodi underwear and your favourite, comfy period knickers! We love ModiBodi’s lace trimmed Period Proof Hi-Waist Bikini for subtle everyday protection, as well as the Full Brief style, perfect for pregnant women and new mums. Great natural products for pregnancy! Save money and feel happier on your period! All about Modibodi period underwear! Top 10 benefits of Menstrual Cups!